Sunday will be the six-month mark since almost 700,000 Rohingyas, mostly women and children, started fleeing violence in Myanmar and arriving in Bangladesh. In one of the biggest and fastest episodes of forced migration the world has witnessed, around half a million people crossed the border in just the first two months after August 25. Early images of tens of thousands of frightened and exhausted families filing through muddy paddy fields or crammed into rickety boats during their flight shocked the world, according to the UN’s migration agency - IOM - on Saturday. The stories the survivors told of what had been done to them in Myanmar, and to the men, women and children who never made it out alive, were even more shocking. Local and international aid organizations, including IOM – which had been assisting smaller numbers of Rohingya in Cox’s Bazar since 2014 – rallied to support the Bangladesh authorities and host community whose generosity in helping the desperate refugees was widely and deservedly acclaimed. Most of those early arrivals spent the first days sleeping in the open – unprotected from the rain with no access to food or clean water. Six months on, the situation is very different. 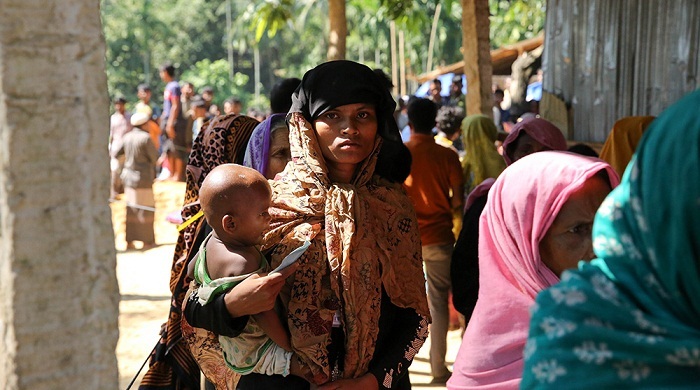 Cox Bazar now hosts what is in effect the world’s largest refugee camp and while conditions remain immensely challenging, people no longer sleep directly exposed to the elements or face imminent starvation. IOM and partners have reached around 600,000 people with emergency shelters, according to IOM release. Other agencies oversee food rations and specific support for children. The joint efforts of IOM and others involved in the emergency response with the Government have provided roads, bridges, drains and latrines – all of which make life safer and a little easier for people in the camps, it said. Work has started to create wells in the south of the district where water is often scarce, provide new health facilities and support to existing ones, and begin livelihood opportunities around these and other efforts that will bring benefits to the host community as well as the refugees. But there is so much more to be done, said the IOM. IOM continues to support those who voluntarily want to return to their homeland and has joined the rest of the UN and much of the international community in calling on Myanmar to ensure a safe, sustainable environment for those Rohingya who wish to go back. But for now, conditions in the camps remain desperately over-crowded and far below any kind of international standard for acceptable living conditions, the UN agency noted. What was once a forested nature reserve is now a vast sea of tarpaulin and bamboo shelters, built on denuded hills that will rapidly turn to mud during the monsoon season. People in the local community, many of whom live in severe poverty themselves, have had to cope with significant upheaval in their daily lives: From major hikes in food prices and firewood shortages, to over-stretched infrastructure and the loss of schools and other buildings which were co-opted during the emergency. Between old and recent arrivals, around one million Rohingya now live in the area. Work to support the community that is hosting them, and which shares many of the same challenges as the refugees, is crucial if peaceful and constructive cohabitation is to continue in the months ahead. Much of the past six months have been spent in emergency mode, trying to ensure people receive the most basic provisions and services they needed just to survive. Projects are now underway to provide other forms of crucial support. These include tackling human trafficking and gender-based violence; programmes to address environmental degradation and initiatives to support local farmers – generating incomes for people in the host community and helping meet the increased demand for food. But the threat of another disaster in this ongoing crisis remains ever-present. At the end of last year, a diphtheria outbreak in the camp created an emergency within the emergency. It is testament to the combined efforts of the Bangladesh government, the WHO, IOM and other partners, and the immense dedication of health staff on the ground, that the loss of life was far less than initially predicted. With the monsoon season starting soon, lives will once more come under threat. Not only from an increase in disease, but also from landslides, flash floods and cyclone conditions, said the IOM. IOM, along with the government and other agencies are working against time to help people strengthen their shelters, to develop resilience and first aid and search and rescue skills for when the worst conditions hit. Slopes are being shored up, drains and roads constructed, and equipment is being put in place to help keep vital access ways open in muddy and waterlogged conditions. Preparations are underway for disease outbreak treatment and medical emergencies. But given the sheer number of people involved and conditions on the ground it will be impossible to mitigate against all disaster, said the IOM. In the past six months, those involved in supporting the Rohingya Response have shown their abilities to work together during what became the world’s fastest growing refugee crisis. IOM, international and local NGOs and donors, the Bangladesh Government and military, the local community and the refugees themselves have all shown their ability to work together during the past six months, it said. Now, as nature brings yet further challenges in the weeks and months ahead, more than ever a joint approach will be necessary.